This annual serves as a bridge between the first Amethyst 12 issue mini-series and the next 16 issue series. 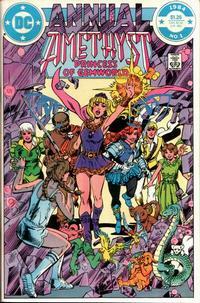 The cover features Amethyst wielding her magic, surrounded by her Gemworld allies Lord Garnet, Lady Turquoise, Prince Topaz, and the Emerald Princesses. Amy’s school friend Rita is crouched down looking up at Amethyst. This story is called “Point of No Return”. Amy is trudging to school with her books, her head facing down. In the background she’s remembering Topaz, Garnet, Turquoise, and herself as the grown-up princess Amethyst. Rita is yelling at her in the school hallway, trying to get her attention. Amy says that she was thinking. Rita encourages a boy named Tom to ask Amy to the Spring Dance. Amy says, “I guess so Tom, I don’t have anything else to do. But I’ll have to check with my Mom and Dad.” Tom asks if she doesn’t want to go to the dance, and Amy says that she does but she has to run to gym class. Amy and Rita are changing for gym. Rita asks Amy what her problem is, since Tom is cute and has a huge crush on her. Amy says that she doesn’t know what’s wrong, she sort of likes Tom too. I can see why Amy would have this dilemma. Topaz does seem to have a habit of being mopey and staring off into the distance, but he is a cute blond man who runs around in tight fitting breeches. Poor Tom is just a typical 14 year old boy. Turquoise wants to know what Topaz thinks of her outfit for the Ceremony of Investiture. Prince Topaz absently replies “Yes…Yes, very nice”. Poor Lady Turquoise acts like a heroine out of a romance comic book, shedding a single tear while thinking to herself that Topaz doesn’t see her because he only thinks of Amethyst. Alas! There’s a storm brewing in the Emerald Domain, and Princess Emmy is wondering if the heavens are crying for her mother and older sister. She’s distracted by a voice saying “Here! I am here!” Emmy sees a ball of light and follows it up to a tower. It says “All who live will be my victims, child, crying my name from parched and dying lips. When the world glows with gemfire that cannot be quenched! HAHHAHAHAHAHAHA!!! !” The light takes the form of a silhouetted woman who must be insanely evil, because she is wearing a SIDE PONYTAIL! Emmy screams. She must be horrified by the side ponytail, although she isn’t really qualified to pass judgment on other people’s hairstyles since she routinely wears Princess Leah buns with green ribbons. Emmy blasts the woman with green magic, and the mysterious side-ponytail lady vanishes. Amy is busting some moves on the basketball court when the basketball starts to glow and transforms into a little orange dwarf. He runs into the girls’ locker room. Amy thinks that there’s only one place a creature like that could have come from – the Gemworld. She runs after him. The dwarf is trying to grab her amethyst pendant out of her locker. Amy executes a flying tackle to grab her necklace. She struggles with the dwarf and it opens up a portal to the Gemworld. She grabs back her pendant and follows him into the portal. Rita comes into the locker room and sees Amy start to vanish. 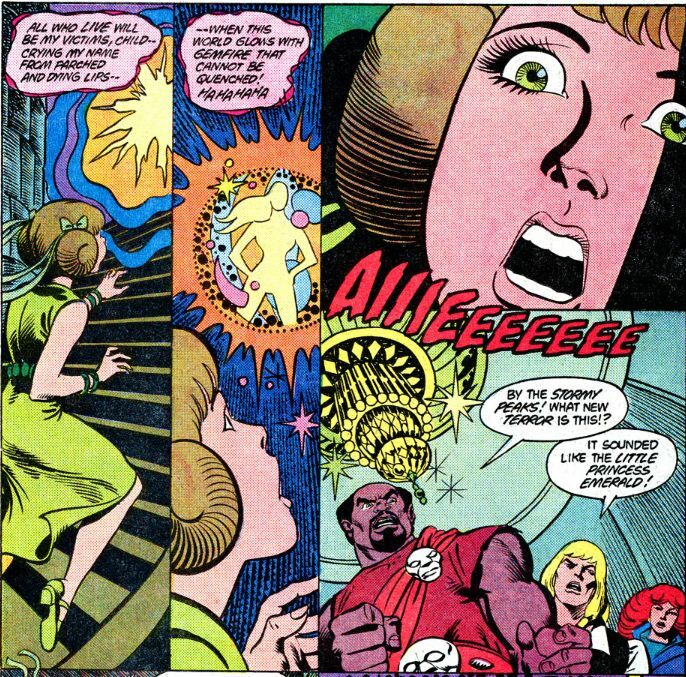 Rita follows Amy through the portal. 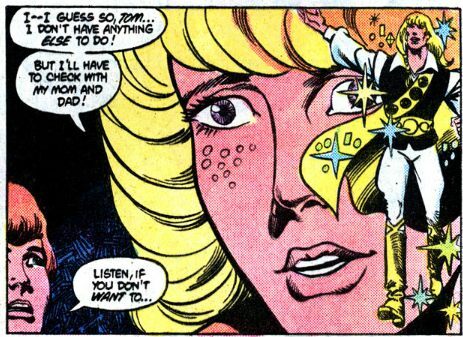 I like how as soon as Amy transforms into Amethyst, she starts referring to Rita as “the nosiest kid I’ve ever known.” She surrounds Rita with some protective magic and heads back to the battle with the dragon-worm. Rita recognizes her and is asking where they are. Amethyst is distracted by the gross sliminess of the dragon-worm as she tries to fight it. Dwarfs, fairies, and other little gemworld creatures try to help Amethyst out by throwing glittering stones at the dragon-worm. She realizes that since the dragon-worm came from the ground it can’t be accustomed to light. She surrounds its head with glittering gemstones and disorients it. It dives for the ground but a giant hand forms from the earth and grabs Rita as the dragon-worm vanishes under the earth. 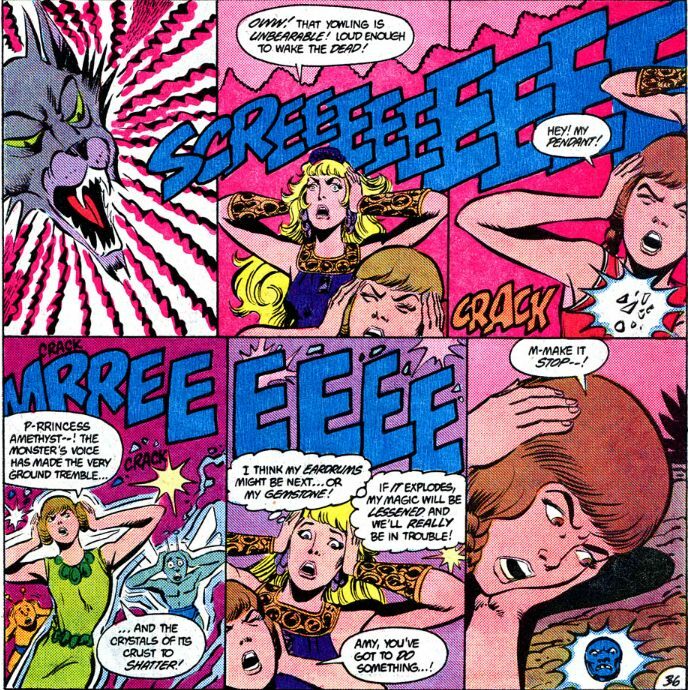 Amethyst tries to go after Rita but is struck on the head by some rocks and she loses consciousness. Emmy is joined by the Gemworld nobility on the top of her tower. She tells Lord Garnet “It was a vision– or an omen! A terrible fate awaits us all”. Prince Topaz wonders if it was a trick of the storm, but Emmy insistes that what she saw was real. Lady Turquoise agrees because also sees a strange ball of mystic light. Turquoise wants to follow the specter, but Lord Garnet says that they have to stay for the Ceremony of Investiture. Turquoise insists that their primary duty is to defeat any potential enemies. A bolt of lighting sets the main hall of the Emerald castle on fire, even though it is still raining. The new Lady Emerald conjures up a magic fireball and banishes the specter and the flames. The storm starts to fade away. Lady Emerald is annoyed because her dress is wrecked and her ceremony has to be delayed. Turquoise is happy that she has a new enemy to fight, and she doesn’t have to wait for the ceremony after all. Amethyst has woken up, and she’s dangling the rhyming dwarf from a mystical purple basketball hoop. She wants him to tell her what happened to Rita. He says he’ll tell her everything, so she lets him down. He explains that he and his companions are loyal subjects of her mother’s. Amethyst’s Mother joined with Lady Emerald and Lord Opal to banish the enemy of the dwarves and elves, and she swore she’d return if the creature returned. The dwarf says that the dragon-worm is just a sign that a greater evil is growing underneath the Land of Opal. Amethyst asks if she’s in Opal’s old kingdom and the dwarf explains that nature has reclaimed it, turning it into a perfect habitat for all the Gemworld creatures that like to stay away from humans. Amethyst says that she’ll honor her mother’s promise. She heads down the dragon-worm’s burrow, with some of the creatures as her companions. A fairy points out a carved opal stone. Amethyst looks at it and says that it’s Rita’s pendant. They have to cross a pool of lava underground. 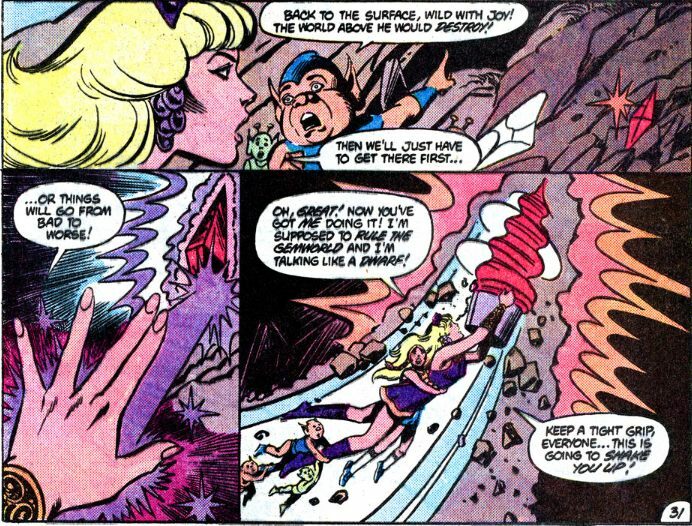 Amethyst creates a magic bridge, but has to swerve to avoid some nasty looking stalagmites. She takes to the air, having all the little creatures hold hands in a chain that she drags behind her. One little dwarf at the end falls off, but an evil looking cat notices says nothing about the dwarf facing death by lava. Emmy and Lady Turquoise are flying through the air on a dragon, looking for the specter that derailed Lady Emerald’s investiture. They head north towards the Land of Opal. In Castle Amethyst Citrina is having nightmares about the storms. She wakes up and says that there is danger lurking in Opal’s lands. Rita is being held captive in a cage on an island in the middle of an underground lake. Amethyst conjures up a sailboard to go to Rita’s rescue, but a fish with a giant fin scoops her up. A lobser-like creature starts to attack her, and Amethyst starts to regret her seafood dinners. She swims under the water and smashes through her aquatic enemies, reaching Rita in her cage. Smoke starts to billow around them and the cat-creature that accompanied Amethyst starts to grow and change. It says that Amethyst released mystical energies when she freed Rita from her prison, and now it is free! It will sweep away the Gemworld’s little creatures into a dark hell! It vanishes in a blinding flash of light. 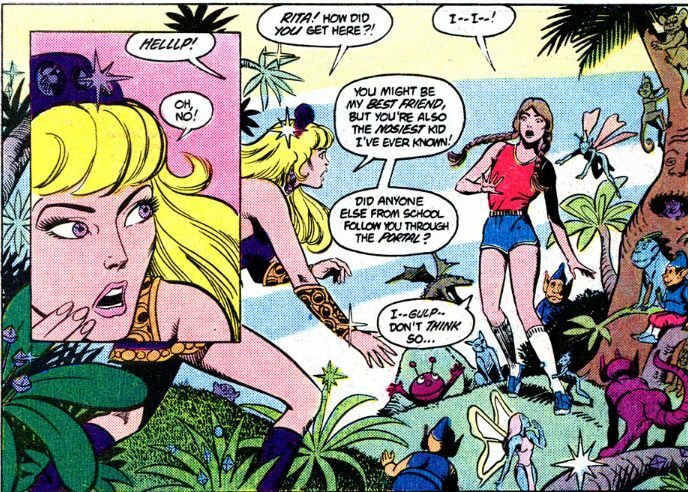 Amethyst checks to make sure that Rita is ok, and asks “Where did whiskers go to?” The dwarf answers “Back to the surface, wild with joy! The world above he would destroy!” Amethyst makes a giant drill to bore their way back to the surface. She’s disturbed that she’s now talking like a dwarf. Amethyst breaks the surface and yells “This is the end of the road for you, kitty cat!” He replies “MEOWRR” Emmy spots Amethyst below. Turquoise says “What is she doing back on the Gemworld?” and thinks, “and why did she have to come back now?” Turquoise and Emmy join the fight against the giant cat. Turquoise tries to help Amethyst with a containment spell, but Emmy runs up to the cat to see if she can sense any information about its true nature. She discovers that it was a wizard’s familiar on Earth who was left behind during the crossing to the Gemworld. The cat managed to go through a portal but was lost between worlds until it ended up on the Gemworld, much more powerful than a pet. Emmy wonders if Dark Opal’s death helped it escape, but she senses another force at work – side-pony tail lady! Side-pony tail lady appears in silhouetted form once again to say “It is a force beyond your ken! The force that will obliterate you! HAHAHAHAHAH!” Everyone is momentarily distracted, but the cat shreds the spell that Turquoise and Amethyst were working on. The evil woman with the perplexing hairstyle fades away, cackling about how she will be Amethyst’s doom. Emmy tries to help the battle by ensnaring the cat in some tree roots. Amethyst and Turquoise dive for it, but it claws Amethyst and tries to run for a tree hanging over a river. Turquoise and the tiny creatures pursue it. The cat starts yowling. The cat’s screams cause Rita’s opal pendant to shatter. Isn’t it convenient that there just happens to be another opal stone on the ground with a very sour expression on its face? Amethyst decides that she has to stop the cat before it blows up any more gemstones, leeching away Gemworld’s magic. She wonders if the evil feline creature shares a cat’s aversion to water, and she snaps the branch it was clinging to and dumps him in the river. While it is distracted Amethyst and Turquoise bind the creature. Emmy suggests taking the creature to Earth, where it will hopefully revert to its original form. 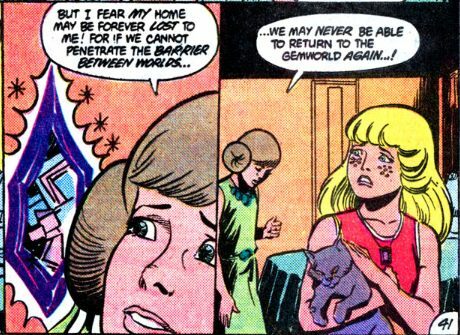 Emmy says she’ll go along to look after Rita while Amethyst works to keep the creature bound, if Amethyst will return her to the Gemworld. As Amethyst, Emmy and Rita journey between worlds, the cat creature gets an arm free and starts to rip through the dimension between worlds. It starts filling up with junk, and the journey to Earth gets much harder. Amy’s back on Earth with a new pet. But Emmy can’t go back to the Gemworld because the portal is clogged! This entry was posted in comics and tagged Amethyst Princess of Gemworld on 9/8/2008 by Anna.